This is a new design and I liked it so well, I made one for myself. 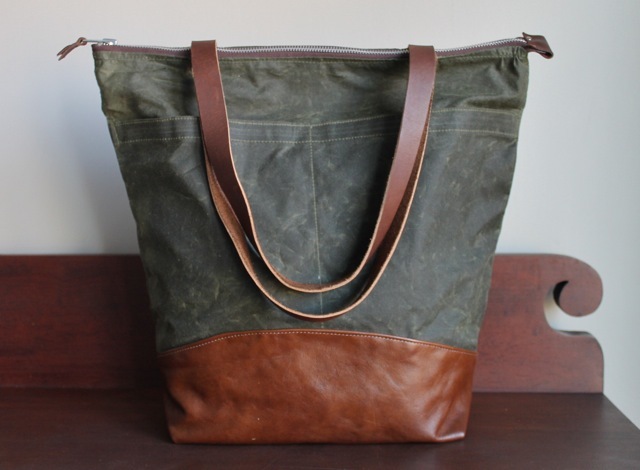 This one is made from a remnant I bought from a cordonnier or shoe designer in Montreal. 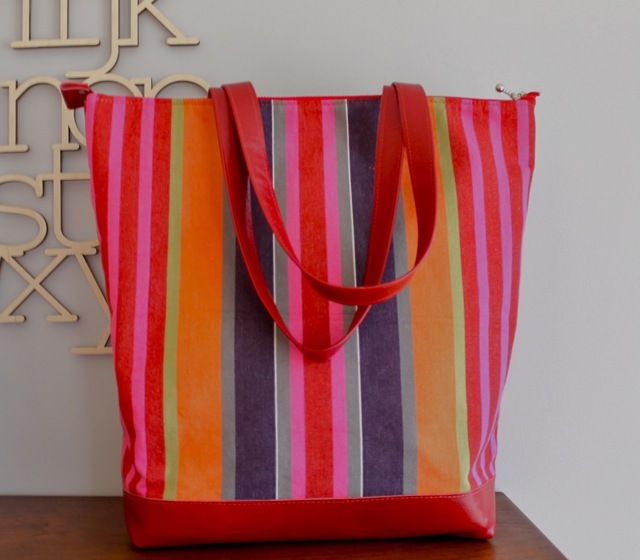 This is a compact bag which is easy to carry, but still holds all you need. 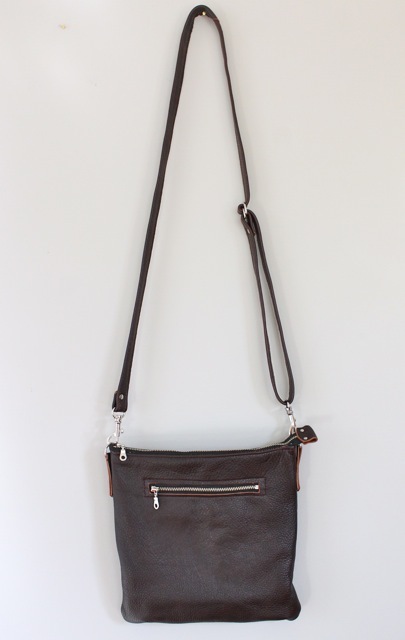 It has a generous outer pocket and a canvas interior pocket and an adjustable strap so it can be worn cross-body or shortened to position it just under your arm for those times you want it to be in your total control. 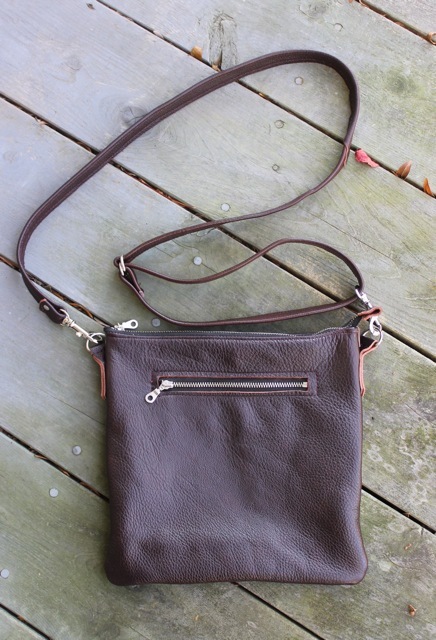 The strap also unclips and you can use the Sherbrooke as a fold-over clutch. Very versatile. 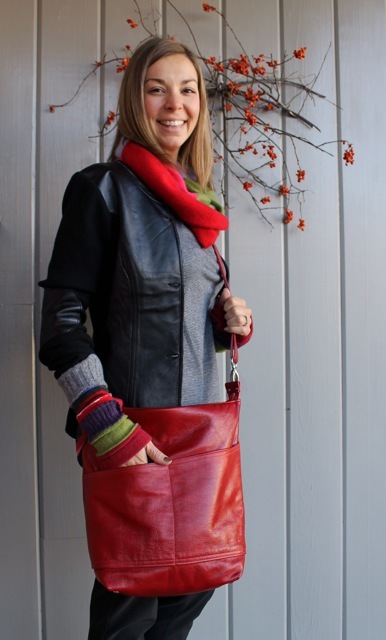 The colour of this leather is mahogany — a great neutral. You can find it in the on-line store. A big thank you to everyone who attended yesterday’s annual show and made it such a huge success again this year! When I was in France with my friend Anne last fall, we bought some wonderful basque canvas in Chartres. 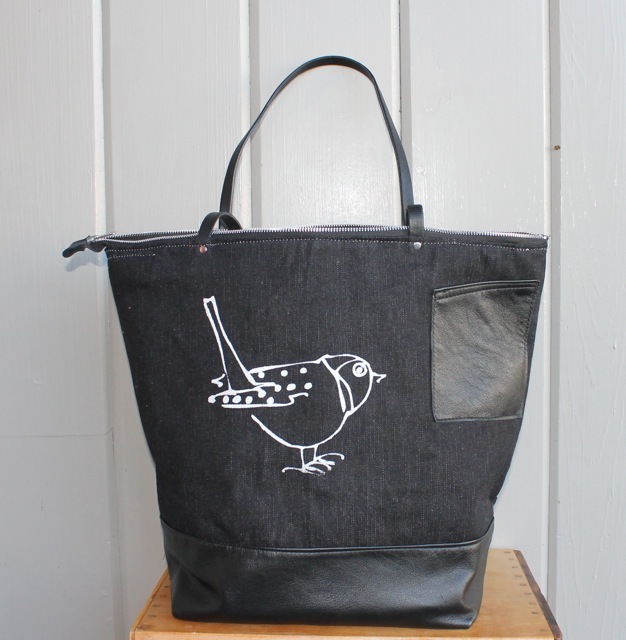 I found one last piece in my bins of fabric, enough to make one final tote. 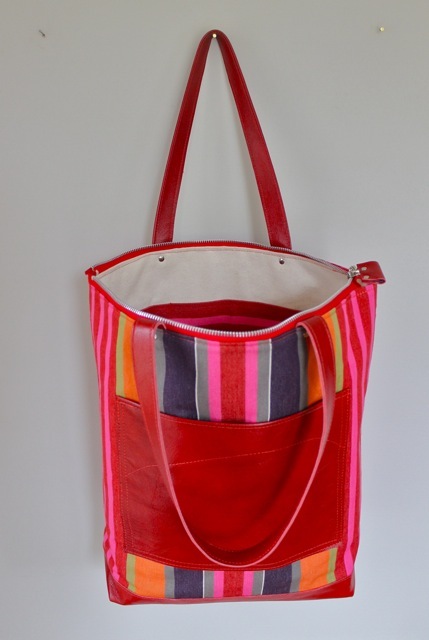 I love the bright colours, especially combined with the beautiful red leather on the bottom, straps and pocket. 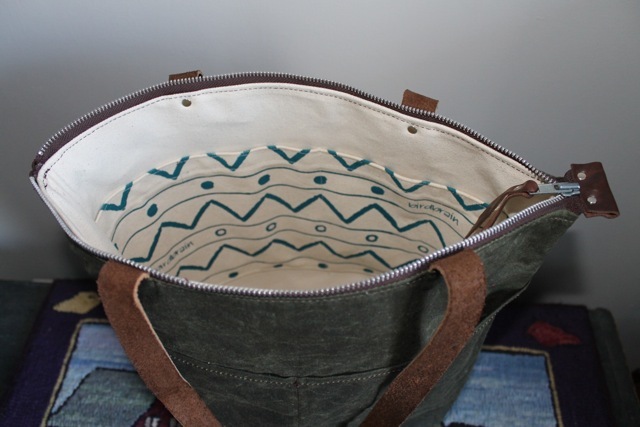 This is a good size, 16″wide, 15″ tall and 5″ deep, and is lined with canoe canvas, so it is sturdy enough to carry many things. 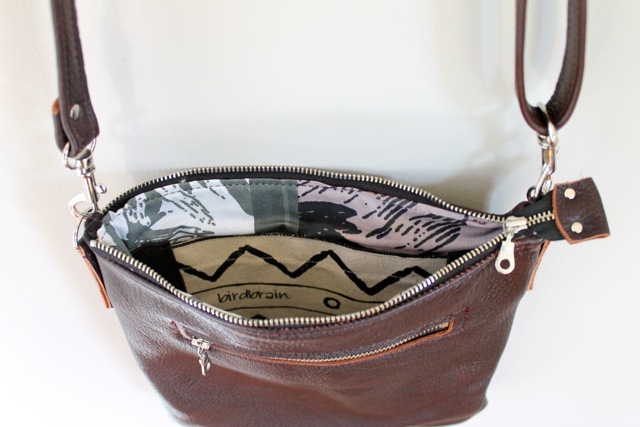 Inside there is a triple canvas pocket and it closes securely with a metal zipper. 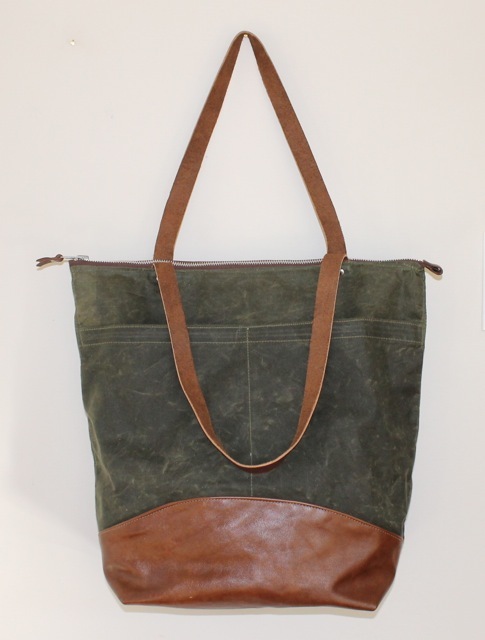 Great for travel or for using every day. A flash of the colours of the south of France. Many months ago I had a chance to order some waxed canvas and the bolts have been in my supply cupboard since then. 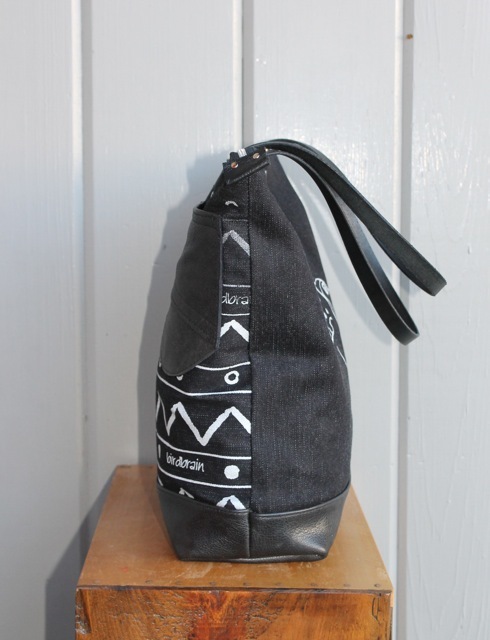 I decided to give it a try this week and made a couple of totes and some pouches. 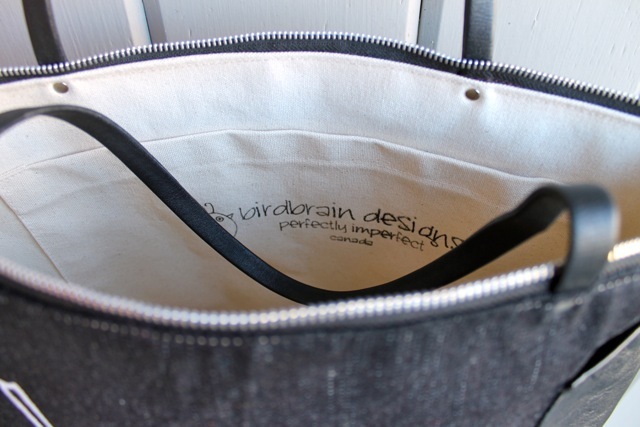 I lined the totes in cream canvas and the pouches in black denim, recycled from a Naf Naf coat of mine that I have been saving. 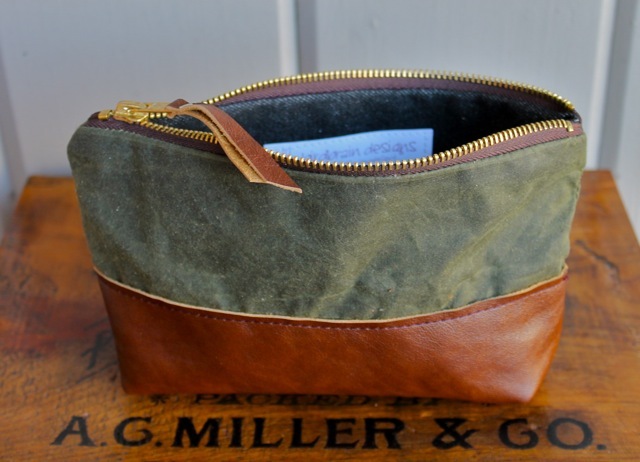 Waxed canvas is a whole new textile for me and I’m getting used to working with it. It seems very durable and stains wipe off with a damp cloth. 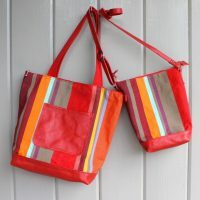 My second bolt is in orange and I am planning to make some aprons with it — before the show I hope! 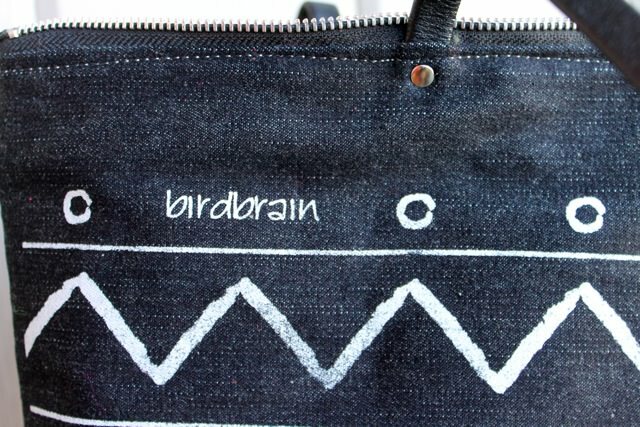 Here are some birdbrain totes in two sizes. 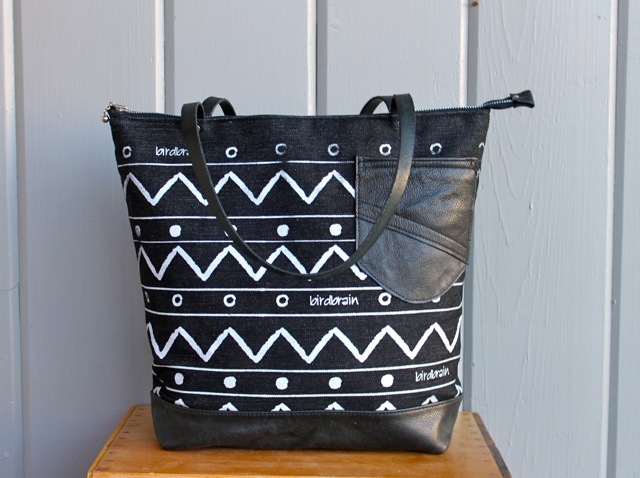 These totes are screen printed on black denim and lined with canoe canvas making them very sturdy. 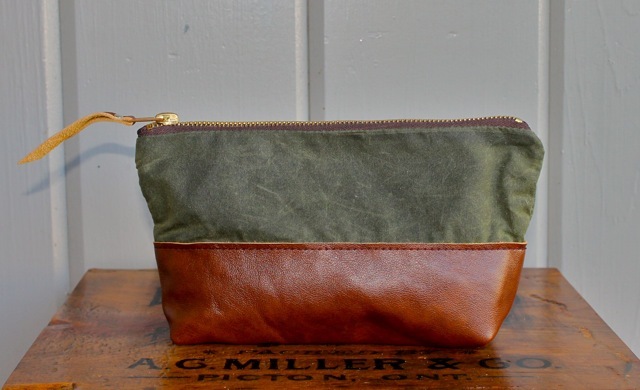 Each has a small leather pocket on the outside for phone or keys and two canvas pockets inside. 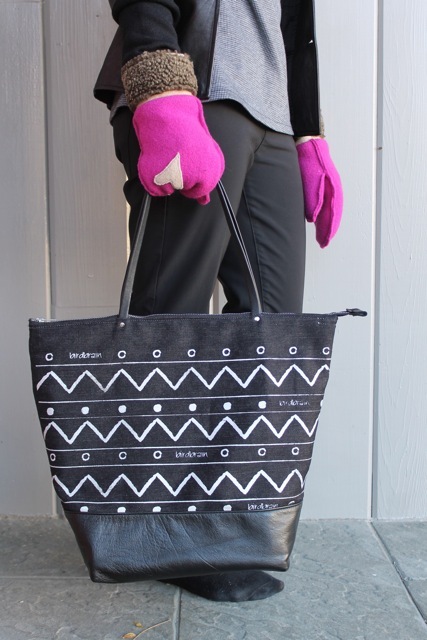 They close with a heavy-duty metal zipper and have leather bottoms and handles. They are so useful for carrying all your stuff. 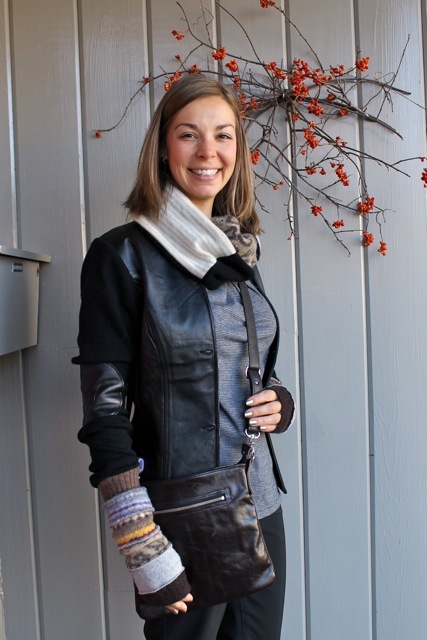 Here is one of my favourite people modelling some of the new things I have been making — cashmere infinity scarves, mittens and finger-free gloves as well as some of the new bags. She makes everything look good. 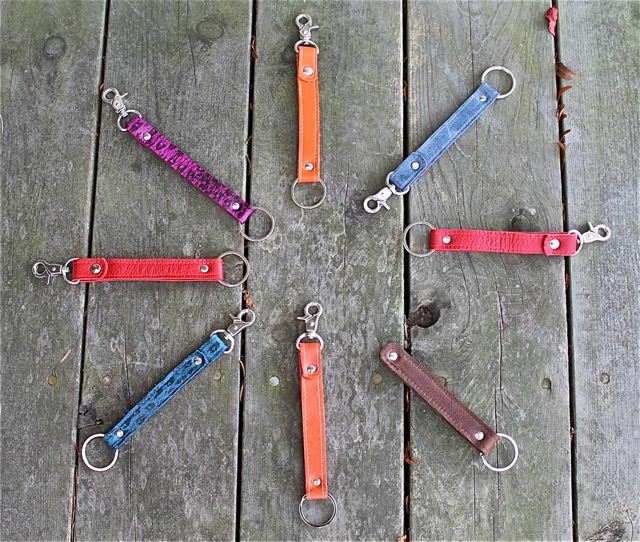 These key rings will be a bright reminder of where your keys are. There is a stainless ring on one end which opens to hold your keys and a clip on the other to hold the key ring securely in your bag or clip on to a special key. 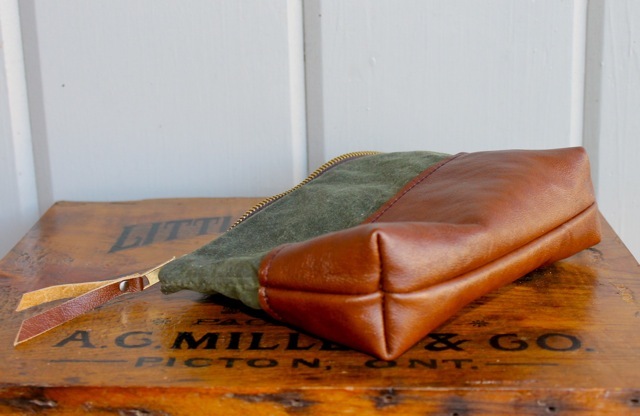 I’ve been saving small pieces of my favourite leather for ages, just unwilling to part with them, and this was the perfect project for them. 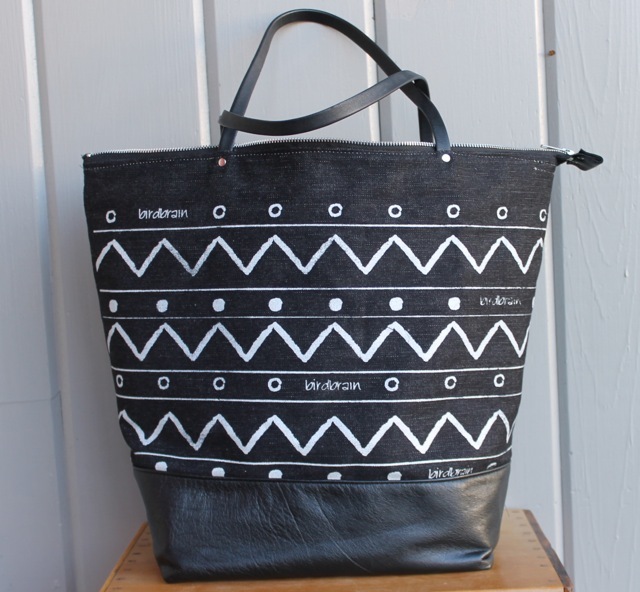 Each is made of two pieces of leather, usually contrasting. The orange, for example, is lined with pink. These will be at the show next week and following that in the on-line store. 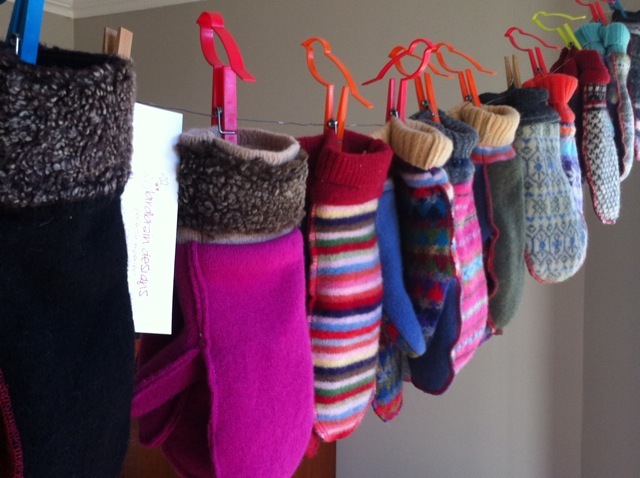 One of the big joys of using recycled wool is the surprise at what is out there waiting. 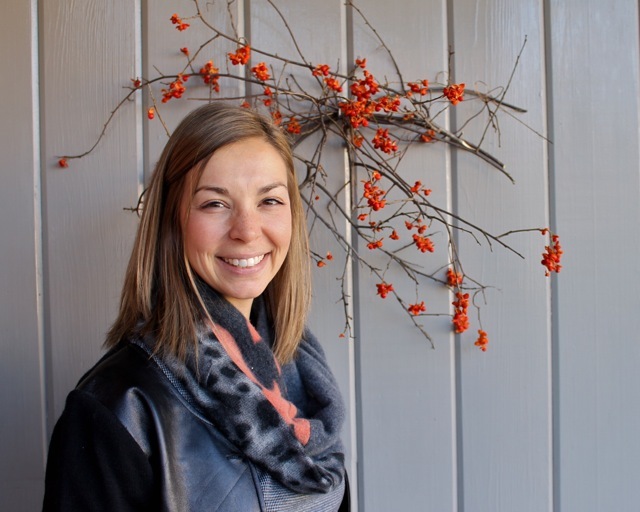 Who knew I would find a boiled wool jacket with embroidered birds? 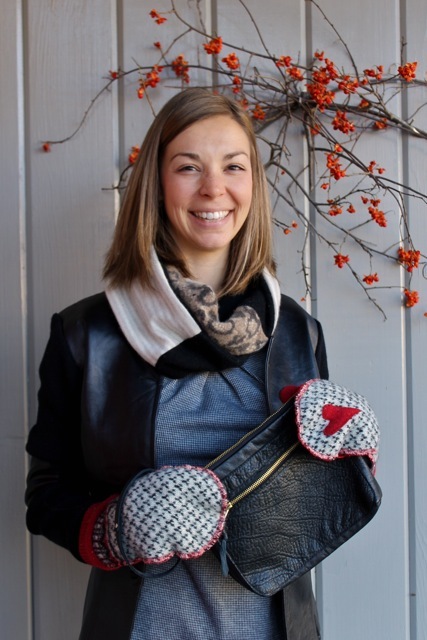 But that is also the downside–there are only three birds on the whole jacket–so these finger-free gloves are truly the only pair. Such jaunty, colourful birds! Too bad the jacket wasn’t covered with them. It did, however, have a daisy on another pocket and I am just pondering what to turn it into. 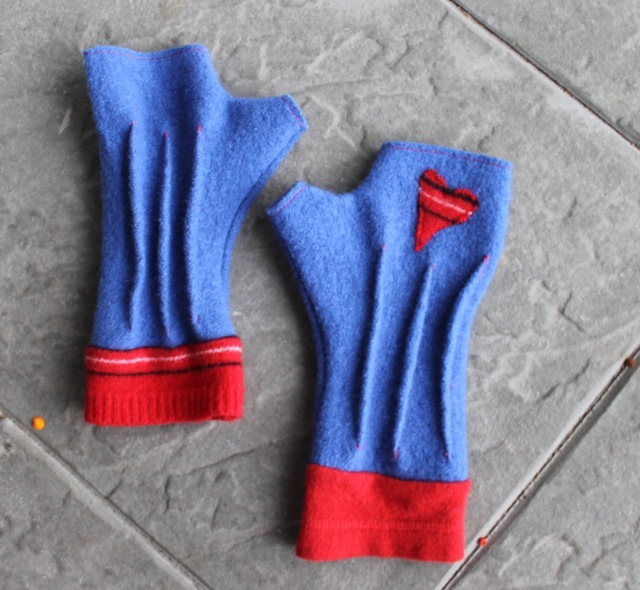 And here are more boiled woollen mittens with shearling cuffs. I am certainly not a furrier, but am learning to deal with this stuff which is so different from anything else I have ever sewn. I also have a white fox jacket given to me by a friend of my mother–it is even harder to deal with, but I am going to give it a try! I love to work with boiled wool and luckily for me the thrift stores abound with cardigans made of this wonderful wool. 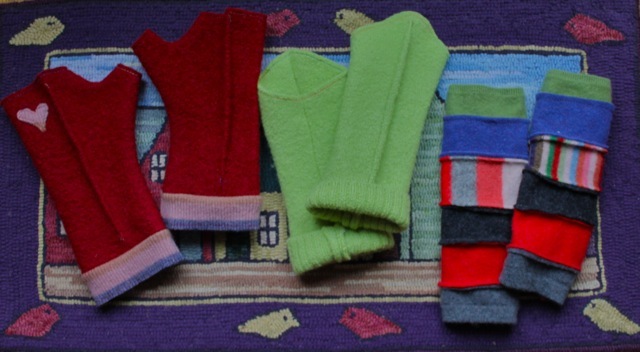 I’ve been collecting it for a while and have made finger-free gloves from it because it is such a dense warm weave. 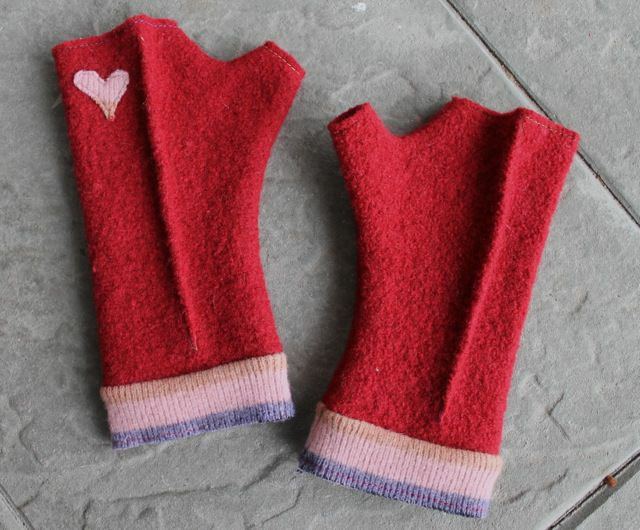 Maybe because it is so cold today, I decided to make some boiled wool mittens and to incorporate a couple of shearling collars I cut from leather coats. 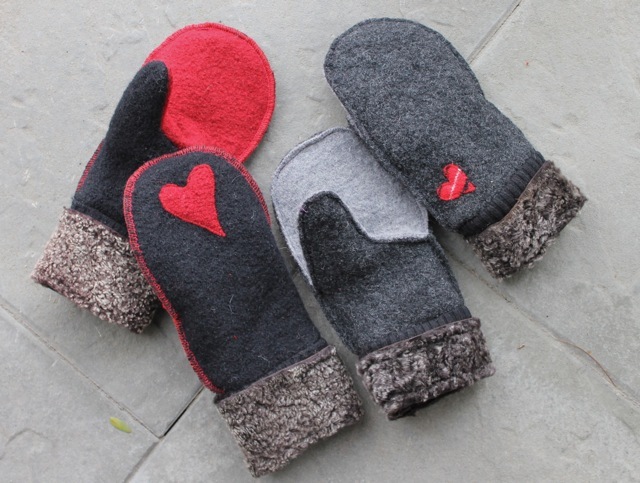 These are the coziest mittens, lined with soft plaid wool and wrists snugged in with sheepskin cuffs. I am working on a pink pair right now and a couple more colours which I hope to show you tomorrow. 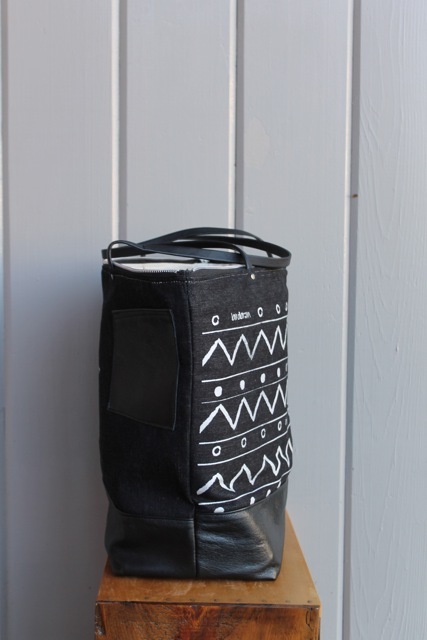 I am going out on my bicycle soon and I may just be tempted to pull on a pair of these! 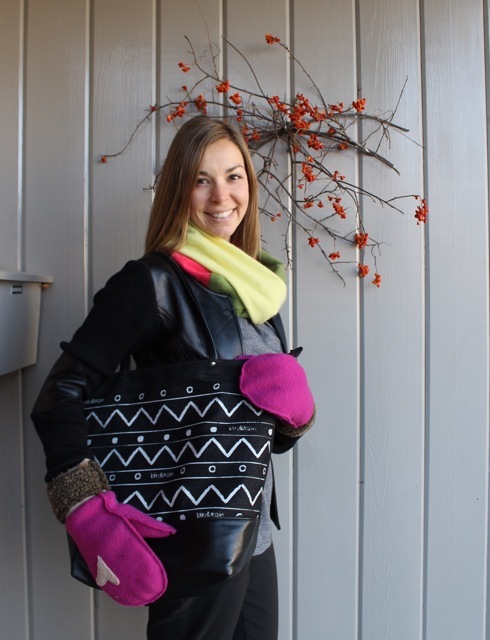 In Southern Ontario we’ve had a hint of snow and so I have been thinking more about warm finger-free gloves. Lately, I’ve been experimenting with different versions and I’m not sure which are my favourites. 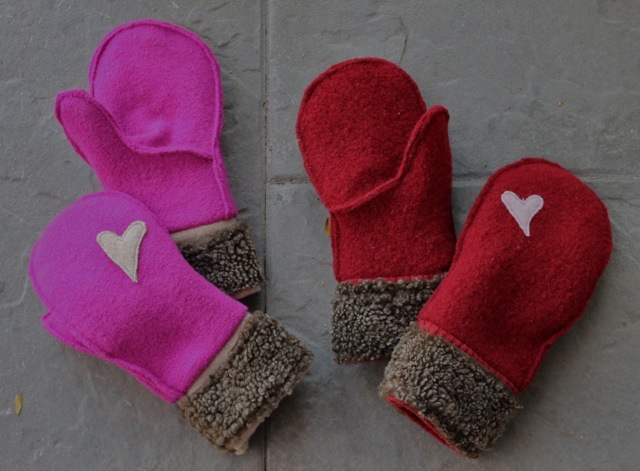 Here are the newest ones — made from boiled wool with sweater cuffs for extra warmth. I like the way these fit and cover much of your hand while still leaving your fingers free. 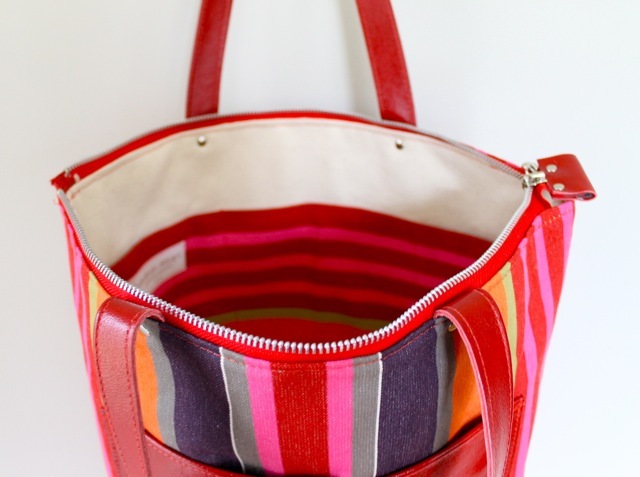 At the bottom are examples of all three styles–each designed to bring a boost of colour, style and warmth to your day. My two favourite sources of inspiration favour the lime green ones in the middle. As for me, right now I am siding with the red ones above. But I do love the funky striped sleeves of colour. My friend June says they can be worn indoors ‘like a bracelet’. All will be available at the annual sale and possibly on-line after November 24. And for the curious, the hooked rug pictured below is my very, very first hooked rug, a Deanne Fitzpatrick pattern of three Maritime houses with my own border of wingless birds! 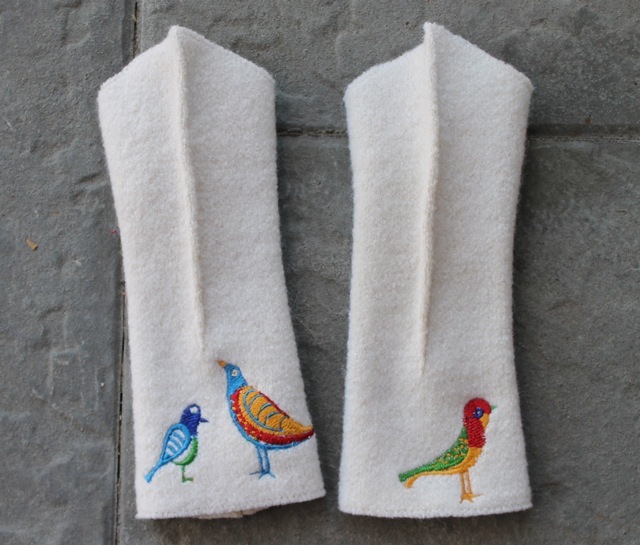 And I’ve been putting at least one bird on every hooked rug since–evolved now to include wings and feet!